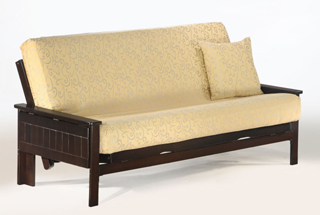 Futon frames are available with a wide variety of finishes, styles, and features. 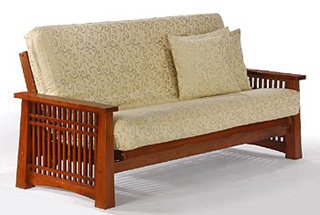 All our futon frames are constructed from solid, high quality, environmentally friendly, hardwood. 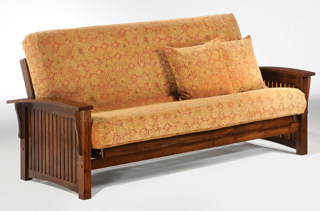 All arm styles come in a variety of sizes: the 39" Chair Twin Lounger, the 54" Loveseat Full Lounger, the standard 75" Full, and the standard 80" Queen. All measurements listed are the dimensions inside the arms, so the overall width will depend on the arm chosen. 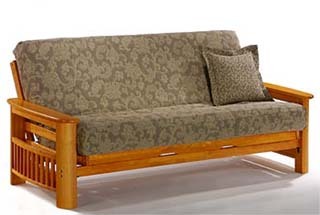 Full and queen size futon frames also feature an optional "Moonglider" front-loading mechanism which makes converting the futon into a bed easy for one person. 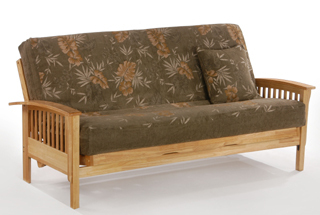 All futon frames include a 3 year limited warranty. 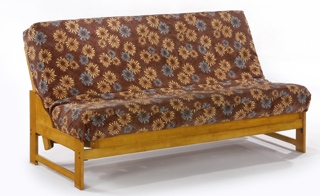 Custom pillow futons are available in a variety of fabrics and sizes, and also make a great, inexpensive ottoman for the 39" Chair and 54" Loveseat! 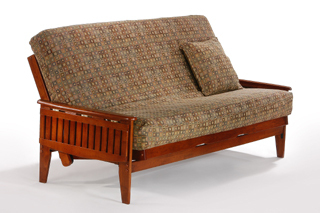 A wide selection of traditional futon mattresses and a huge selection of removable futon covers are also available. 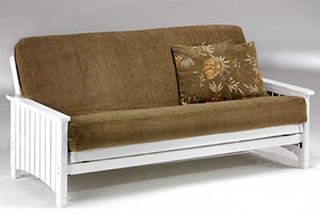 All Futon products can be shipped anywhere in the continental U.S. Contact Us for shipping costs. 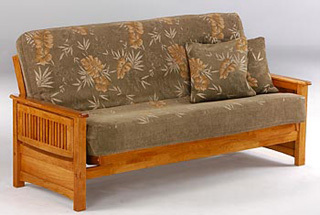 A wide variety of other furniture products featured on Night and Day Furniture may be ordered by contacting us. 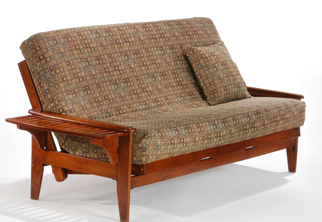 A 39" Seattle futon chair frame shown in natural finish, in the lounger position. All fuon arm styles come in this size! 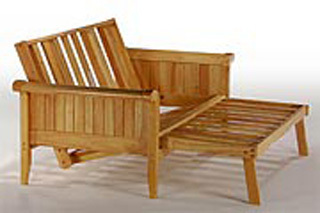 Roll-over the image to see the chair in the bed position! 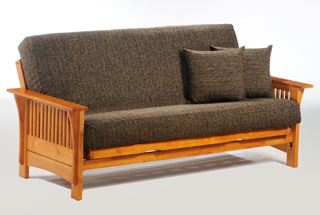 All futon arm styles are available in both the 39" Chair Twin Lounger and 54" Loveseat Full Lounger Sizes. This is the measurement of the seating area between the arms. 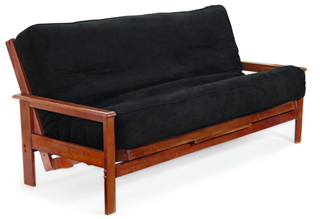 A pull-out ottoman section allows the 39" Chair and 54" Loveseat, when reclined, to serve as standard length twin and full beds, but in a much smaller package. 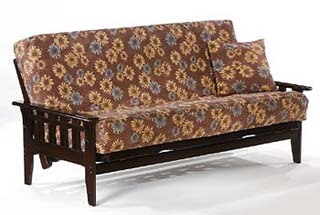 Pillow futon cushions in all fabrics and traditional futon cushions with removable futon covers are also available. 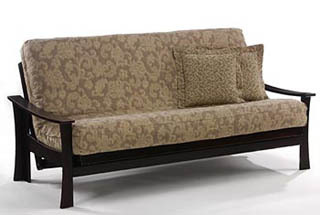 Futon cushions for the 39" chair and 54" loveseat come in two sections, the body and the ottoman, for easy storage and better appearance. 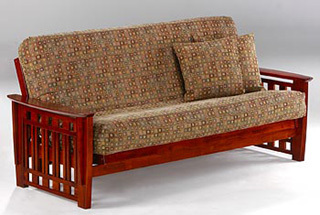 High Quality, Solid Hardwood Futons With A Variety Of Styles, Sizes, Finishes, And Features. 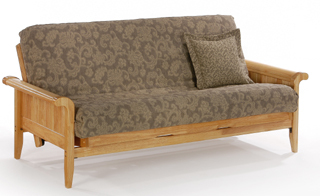 Finishes are available in black walnut, cherry, dark chocolate, honey oak, and natural. Traditional side-loading bifold frames are also available for the full and queen sizes at $20 less than the above listed prices. The 39" chair and 54" loveseat convert into twin and full size beds. 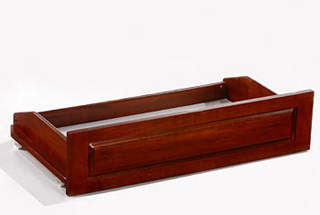 Accessory storage drawers are also available for full and queen size frames. Finishes are available in black walnut, cherry, dark chocolate, honey oak, and natural, and white. Roll Over The Image To See How The Pop-Up Arms Work! The Naples also features pop-up table arms! 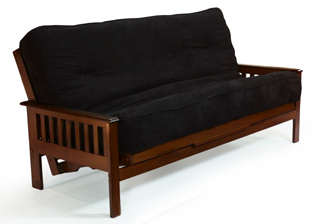 The Seattle Full Futon Frame In Dark Chocolate Finish. The Seattle also features pop-up table arms! 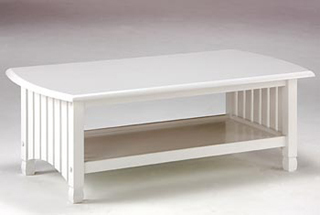 Finish is available in white. The Sunrise also features pop-up table arms! The Portofino also features pop-up in-arm storage compartments with drink holders! 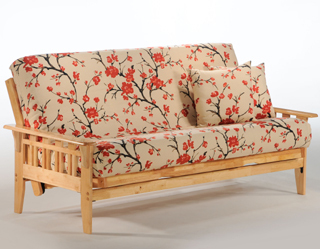 The Solstice Full Futon Frame In Cherry Finish! Solid wood. Finishes available in honey oak, natural, and dark chocolate. Solid wood. 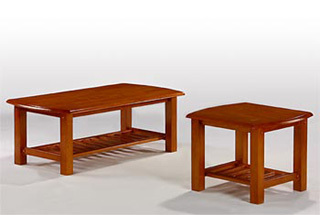 Finishes available in medium oak, cherry, black walnut, and natural. Solid wood. Finishes available in white. 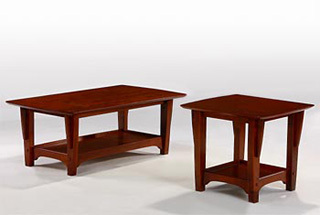 Finishes available in black walnut, cherry, dark chocolate, honey oak, natural, and white. Rolling accessory drawer sets match all the futons in the standard collection and come two to a pack.